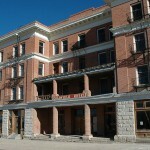 The five-story Victorian Mizpah Hotel, built in 1907, is believed to be haunted by a few of the prostitutes from its early days. A Lady in Red may be the most famous, known to touch men’s hair or brush against them. According to the stories told here, she was beaten and strangled here by a jealous ex. Her perfume lingers in the halls, and sometimes her ghost is seen talking to a miner’s ghost. A greenish-blue ghostly woman and several men are also seen here, but quickly vanish. Another story is sold here of a politician who died in a room on election night. The body was kept on ice in the bathtub, waiting for election results to make the announcement, which may explain the man’s apparition that has been seen laughing near the hotel’s bathtubs. In the hotel’s basement, several miners’ apparitions have been spotted. We drove through town late, late one evening during spring break on our way to a tournament in Tahoe. 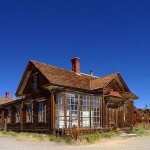 We had intended on finding a room in Tonopah because we were dead tired. However, all of us in the car got the weirdest feeling as we passed the hotel and decided to press on. A really weird feeling, like nothing I’ve ever experienced. I looked it up when we got back into the land of free data and discovered the history of Mizpah Hotel. I want to go back now that I know, but it’ll have to be on my own accord, the kids will have none of it and my husband would “rather not.” Any takers? If you do go, ask specifically for the haunted room. I believe its on the 3rd floor? Also, the Lady in Red is said to favor men. Staying in room 510 right now. The closet door opened by itself and the dresser drawer opened about 8 inches. I pushed it closed and it slid open again.